I devoured my advance copy of Mobile First in less than three hours. Not a second of that time was wasted. Luke has packed oodles of data, scads of examples, and years of experience into this admirably brief book. It's a brilliant explanation of why we should design for mobile first, and how. Every information architect and experience designer should read this book. It will change the way you work today and how you think about tomorrow. 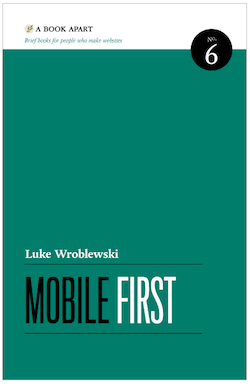 In short, Luke Wroblewski has gone big by going small. You should too! Can't wait for the book? Read Luke's optimization article. Or try Responsive Web Design, the perfect complement to Mobile First. Or be at EuroIA in Prague tomorrow for Luke's opening keynote. At UserFocus 2011 I'm delivering a keynote (slides here) that features a new illustration I call the cross-channel crystal. 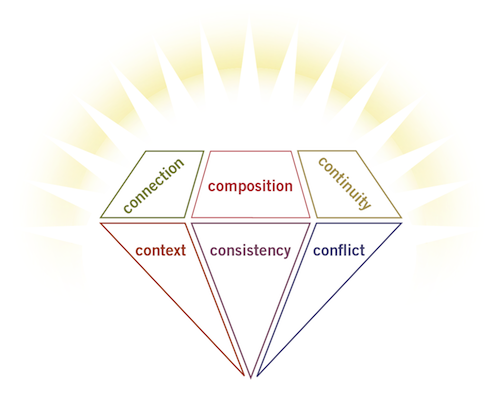 The crystal is intended to catalyze conversation around the formulation of cross-channel strategy. Composition. The mix of platforms, devices, and media (and the features of each). Is the service multi-channel or cross-channel? Consistency. Symmetry of brand, features, organization, and interaction must be balanced against platform-specific optimization. Connection. Bridges across channels (e.g., links, tags, addresses, barcodes, signs, maps) must be visible at the point of need. Continuity. Apps should maintain state so users can flow between devices while reading books, watching movies, shopping, etc. Context. How will time, location, device constraints, and personal or social context impact use cases and user psychology and behavior? Conflict. To address channel conflict and free riding, we may need to realign incentives, metrics, the business model, and the org chart. Of course, this crystal is but a diamond in the rough, so please send your feedback. What's unclear or unnecessary, and what am I missing? Thanks!